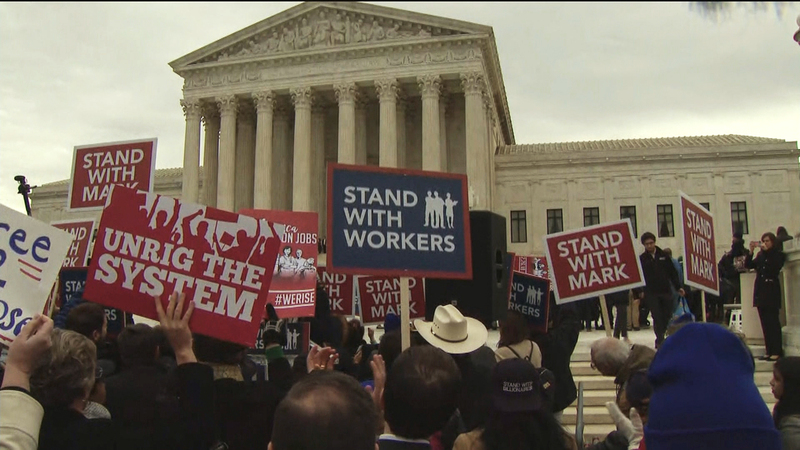 As soon as Thursday, the U.S. Supreme Court will issue an opinion on a case known as Janus v. AFSCME—a case with roots in Illinois that could have consequences nationwide. The outcome stands to determine the future of public sector unions, which in turn would flip some power dynamics and change our modern political system. A recent study by the Illinois Economic Policy Institute’s Frank Manzo and Robert Bruno, with the University of Illinois Urbana-Champaign’s School of Labor and Employment Relations, predicts “lasting changes on the labor movement” should the court toss the status quo and overturn the 1977 “Abood” decision. The “Janus” in this case is Mark Janus, a child welfare specialist who works for the state of Illinois. His name is on the case, but he’s got the backing of heavy hitters like Gov. Bruce Rauner, and is backed by groups lifted by wealthy donors like the Koch Brothers and Illinois’ Richard Uihlein. He’s suing because he says that mandate is a form of government-compelled speech, so a breach of his First Amendment rights. On the other side of the case is the American Federation of State, County and Municipal Employees Council 31, the labor union that represents most state government employees. Per federal law, AFSCME (and other public unions with exclusive bargaining rights) can’t just negotiate for its members; the union must represent everyone in a workplace covered by a collective bargaining unit. So even though Janus doesn’t want to be part of AFSCME (and is not a member), he does get wage increases, vacation time and other benefits secured by AFSCME’s state contract. If Janus has a workplace problem, AFSCME would have to cover him in arbitration. Fair share dues are supposed to cover those expenses, but nothing more—no political work. Member dues can go toward political activities like lobbyists and candidate support. Unions say it’s only appropriate that non-members pay these dues, given the expense of negotiations and arbitration. The thinking is that someone who skirts the fee but still gets union-negotiated benefits is a freeloader. While there’s no telling what the high court will do, prognosticators predict that with President Donald Trump’s nominee Neil Gorsuch on the bench, justices will flip the status quo. That would only have a direct impact on public sector unions (city and state workers, plus, significantly, teachers) in the 23 states, given that in right-to-work states like Wisconsin it’s a moot issue because right-to-work restricts “fair share” clauses from being part of a collective bargaining agreement. But if the court tosses fair share fees, unions could see a steep decline in membership. When money’s tight, who will pay for something they could get for free? With fewer members, and therefore less money, labor would lose political power—ostensibly putting Democrats at a disadvantage while giving the GOP a leg up. With less power, unions won’t have the ability to negotiate as plum of contracts for their members, meaning wages and compensation packages for public sector workers would go down. To some, that’s horrible. A hit to the middle class. To others, that’s the very idea. It would rein in government spending. Both sides are gearing up for the looming decision, with unions trying to convince members of their organizations’ worth and critics preparing to entice workers to drop out of unions.